There will be another 24-Hour Sale on Monday 28th, so be sure to pop back next week for the Sneak-a-Peek. Or why not like my Facebook page, www.Facebook.com/CamsCreativity for this and more! How is your Christmas crafting coming along? Are your Christmas cards ready? Our new Stitched Shapes Framelits Dies and coordinating stamp sets can help you create timeless cards that are handmade with love. And what's even better is, these stamps sets are 25% off only until 30 November. Get them now, before they sell out (again). 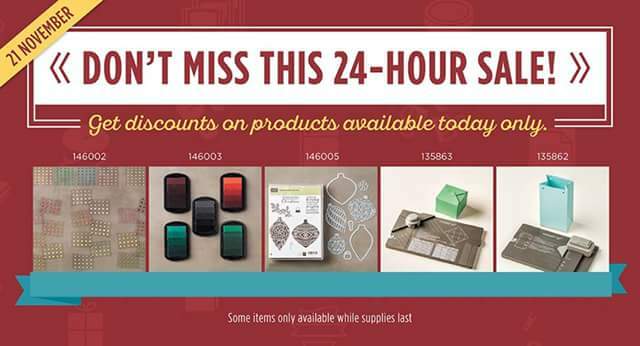 There has never been a better time to shop with Stamping' Up! And there has never been a better time to join as a Demonstrator! Whether you are looking to get a discount off of your own crafting supplies orders, or your looking for full- or part-time work, I can't think of anything better. I'm coming up to my second anniversary with Stamping' Up! and I love it! OK, so family commitments may make it difficult for me to craft as often as if like, but the discount alone makes joining worth it. Why not visit my website for more details? Labels: Cams Creativity, card making, Online Extravaganza, paper craft, rubber stamping, Stampin' Up!